I realize that it’s been a while since you’ve been in the classroom, and you may have forgotten the sacred nature of teacher planning time. You’ve most likely buried the memory of having only 20–30 minutes of free time during the day. You know, the time used to plan lessons, go to the bathroom, eat lunch, call parents, cry if you need to, and clean out your inbox. So I’m writing to remind you that teacher planning time is our lifeline to surviving the teaching day. Taking it away is like draining the oxygen from our lungs. When it’s stolen regularly, oxygen depletion settles in, and you’ll find yourself with frazzled, fatigued, and frustrated teachers. As teachers, we feel disrespected when you take this time from us. It communicates that you don’t think we have anything better to do or that this time is optional—which it isn’t. 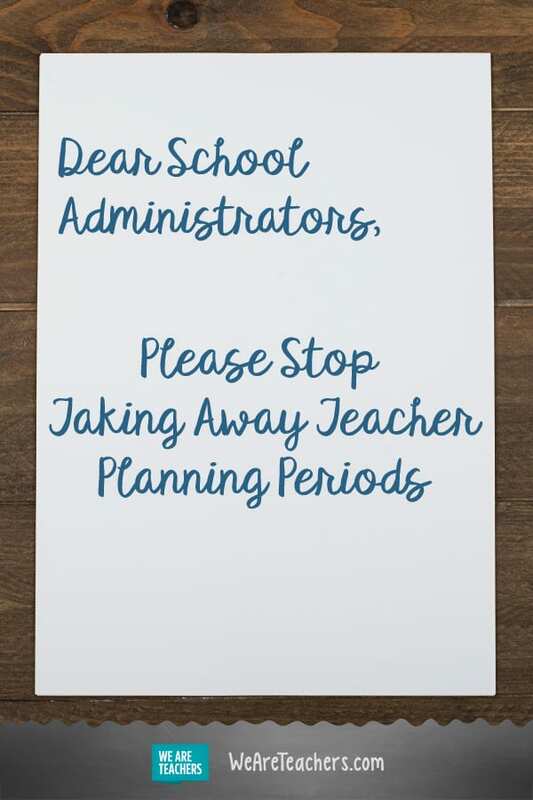 Maybe if you knew how much this planning time contributed to the quality of our teaching, student assessment, professional development, relationships, extracurricular participation, and personal health, you’d feel differently about asking us to skip it or cut it short. Here are some of the vital reasons we need this time. Planning periods have a big impact on the quality of our daily and long-term teaching practice. Amazing pedagogical practice isn’t created overnight. It’s curated during bits and pieces of planning time strewn together into engaging lessons, units, and long-term plans that effectively reflect curriculum expectations. Teachers need planning time to think about, sketch, physically set up (and take down), and reassess daily teaching practices and whole units. Without this time we’re left scrambling to photocopy workbooks from 1999. Boring. Student assessment suffers when planning periods are limited. When working on a challenging skill or multilayered lesson, students require effective formative feedback before moving on. Without our daily planning time, student assessment takes a back seat. When planning time is constantly disrupted, so is student assessment. The quantity and quality of assessments decrease which, in the long run, negatively impacts student learning, as they’ve had fewer opportunities to acquire skills. They need time to demonstrate learning or get feedback before a taking summative assessment. Planning periods are our self-driven PD sessions. It isn’t a secret that most district-wide professional development sessions are too generalized to have any kind of significant impact on teaching practice. It’s for this reason that many teachers use planning time as self-driven PD sessions. We browse the Internet for new teaching ideas and resources, read reflective articles from great teacher blogging sites, such as We are Teachers, and check in on professional social media accounts. We use this time to spark our creativity and curiosity about teaching methods and practices. This is valuable time to expand our comfort zones by applying what we’ve learned in our own classrooms. We use planning periods to build relationships. One of the most important uses of planning periods is to build relationships with students, colleagues, and parents through conversations, emails, or phone calls. Teachers often spend their planning time meeting with students who need extra help or a sympathetic ear, discussing student progress with colleagues and administrators, or collaborating with like-minded colleagues. If we don’t have time for an actual conversation, we may squeeze out at least an email. This is still part of a valuable tool to build strong relationships. Since it’s rare that we have time alone during the day, planning periods are also used to call parents to discuss student progress. Extracurricular activities and field trips require planning periods. Most administrators beg teachers to volunteer for extracurricular activities, clubs, teams, and field trips. So you should be aware that without planning time, these events would not occur. It’s during our planning time that we plan, copy, organize, and so much more. Want cool stuff going on at your school? Then give teachers the time to make it happen! We love making school fun. Most importantly, planning periods contribute to our personal health. I’ve saved this point for last because of its significance to teacher performance and its impact in preventing teacher absenteeism. Without daily planning time, teachers don’t get a chance to take care of their basic physical and mental needs. If you’ve ever encountered a hangry teacher who hasn’t gone to the bathroom in four hours or had a minute’s peace, you know what I’m talking about. Teachers use planning time to tend to their physical needs as well as to mentally recharge their batteries, reset from a bad start to the day, or take a moment to recuperate from daily emotions. Without these physical and mental breaks, stress begins to creep into teachers’ lives. This can lead to physical illness and eventually absence from work. Listen, we get that sometimes half your staff calls in sick on the same day. Sometimes you desperately need someone to cover the kindergarten class before there’s a call to 911. We’re OK with that. But please don’t constantly abuse our kindness and professionalism by constantly taking it away. This oversteps boundaries and destroys relationships. Moreover, you’re essentially destroying the quality of education that is delivered at your school. Please stop taking away our planning time, unless it’s absolutely necessary. Teachers who need their planning time or they ain’t gonna to make it ‘til June. 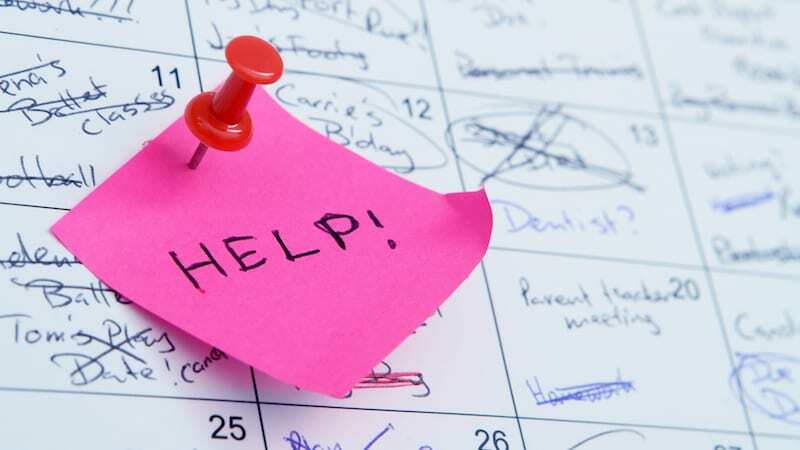 How do you deal with admin asking you to give up your planning period? Come and share in our WeAreTeachers HELPLINE group on Facebook. Plus, check out ways schools can support teacher mental health.